Ideal for young students, the Asus Chromebook Flip C101PA is a well-rounded 2-in-1 with an attractive lightweight aluminum chassis. 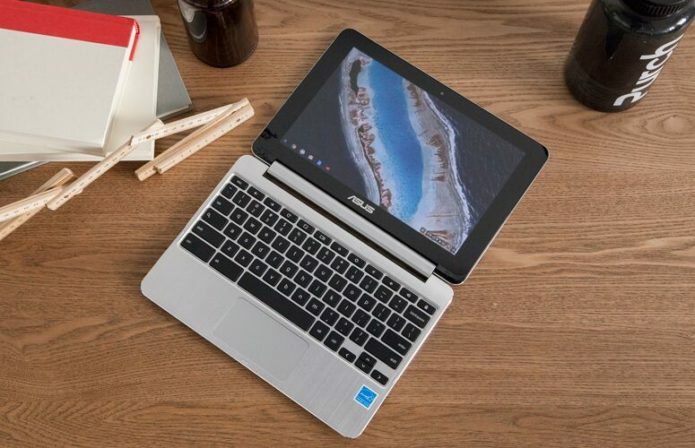 The $299 Asus Chromebook Flip C101PA is a sleek 2-in-1 Chromebook that is ideally suited for grade-school students. The Flip offers an attractive lightweight aluminum 2-in-1 that packs a pretty good 10.1 touch-screen display, above average battery life, solid performance and a good keyboard. Unfortunately, its petite size makes it less appealing for adults, and more suitable for kids. Thanks to its aluminum chassis with rounded edges, the Chromebook Flip C101PA is quite an attractive little guy. Its all-metal body is complemented by a black bezel and black keyboard keys that create a premium MacBook Pro-inspired look. Weighing just 1.9 lbs. and measuring just 0.6 inches thick, the Chromebook Flip C101PA is also one of the smallest and lightest Chromebooks around, and quite frankly, it’s downright adorable. Its petite size lends itself to being very kid-friendly. We can easily see this being a device that kids throw in their backpack and use throughout the day. And although it’s not designed to survive drops like the Lenovo Flex 11 Chromebook, its aluminum build feels very durable and sturdy, and it seems like it would handle the rigors of a classroom environment quite well. The Chromebook Flip C101PA is also a true 2-in-1 with a sturdy 360-degree hinge that supports using the device in four modes. So you can use the Chromebook Flip C101PA like a traditional notebook, or flip its display around to use the device like a tablet, or place it in stand mode, which is ideal for watching movies. Finally, the Flip C101PA can be used in tent mode, which is great for video chats. The device’s hinge is strong but flexible, making all of these modes easy to transform into. The 10.1-inch, 1280 x 800 IPS touch screen on the Chromebook Flip C101PA is pretty good and certainly above average for a Chromebook in its price range. When I watched the Justice League trailer on it in 1080p, the visuals were sharp, colors were solid and hardly dull, but they lacked vibrancy. Overall, the experience of watching movies on the Chromebook Flip C101PA is pretty good. The Chromebook Flip C101PA covers 74.3 percent of the sRGB color gamut, falling well below the ultraportable average (98 percent) but a smidge more than the Dell Chromebook 3180 (72.8 percent) and Lenovo Flex 11 (73 percent). It was nowhere near the Lenovo Miix 320 (95 percent), however. The 10.1-inch, 1280 x 800 IPS touch screen on the Flip C101PA is certainly above average for a Chromebook in its price range. Despite being average when its comes to its sRGB color gamut, the Chromebook Flip C101PA helps make up for things a bit with its above-average brightness levels. The display emits up to 290 nits of brightness, which is way superior to the scores of the Dell Chromebook 3180 (210 nits), the Lenovo Miix 320 (218 nits) and the Lenovo Flex 11 (227 nits). I found viewing angles on the Chromebook Flip C101PA to be very good. The glossy display, however, creates significant glare when looking at the display from extreme angles. Despite its relatively small chassis, the keyboard on the Chromebook Flip C101PA is quite comfortable, and certainly better than what we’ve come to expect on a low-cost Chromebook. The keys are small, but they are spaced well and offer good feedback. The key travel is very good at 1.6mm, and I was able to type on it without ever feeling too cramped. I tested the keyboard with the 10fastfingers.com typing test and got a 67 word per minute result, which isn’t too far behind my 75 wpm average. Likewise, the 3.4 x 1.8-inch buttonless trackpad is quite spacious considering the device’s size. It’s very responsive with just the right amount of sensitivity, and you only need to tap lightly on the trackpad. For such a petite and budget-friendly Chromebook, the audio on the Chromebook Flip C101PA is surprisingly robust. The Flip C101PA was able to handle playing a 1080p video while also having 10 tabs open in Chrome, and the Instagram Android app open — all without slowing down. The speakers get loud enough for comfortably watching videos and listening to music without straining your ears – even in a moderately noisy environment. Music tracks sounded quite balanced, as did soundtracks from TV shows and movie trailers. The Flip C101PA is powered by the new OP1 Rockchip 3399 processor, which integrates a dual-core Cortex-A72 and a quad-core Cortex-A53 with a separate NEON coprocessor. This processor has been designed specifically for Chromebook, and for running Android Apps. The processor runs alongside 4GB of RAM. Overall, the Chromebook Flip C101PA is a capable performer. It’s no speed demon, but it was able to handle playing a 1080p video with no issue while also having 10 tabs in Chrome and the Instagram Android app open — all without slowing down. The all-metal body, black bezel and black keyboard keys create a premium MacBook Pro-inspired look. On the WebGL Aquarium graphics benchmark test, which measures 3D graphics’ prowess by showing a tank full of 2,000 fish swimming, the Chromebook Flip C101PA earned a rate of 34 framers per second (fps). That indicates that it’s faster than the Dell Chromebook 3180 (26 fps), and almost on a par with the Lenovo Flex 11 (37 fps). The Chromebook Flip C101PA offers fairly strong endurance, lasting 8 hours and 56 minutes on the Laptop Mag Battery Test, which involves continuous web surfing over Wi-Fi. That runtime is not quite as good as the Lenovo Miix 320 (9:17), but it’s significantly better than the Lenovo Flex 11 (7:57) and on par with the Dell Chromebook 3180 (8:55). Overall, the Chromebook Flip C101PA’s battery life is better than average, and enough to get most students through a day of classes and then some. The HD Web Camera is on a par with what we would expect at this price. It does OK in low light, but in general tends to produce grainy, washed-out video. So it does fine for video chats, but don’t expect to take any great selfies with it. The Chromebook Flip C101PA runs relatively cool. Even when playing back HD video, we never noticed the device heat up much at all during use. We recorded 89 degrees at its hottest location at its left underside, while the touchpad came up as 82 degrees, the keys at 83 degrees and the underside at 86.5 degrees. Anything over 95 degrees would have exceeded our comfort threshold, and the Chromebook Flip C101PA didn’t go near that. In addition to the Chrome Web Store, the Chromebook Flip C101PA lets you access and download apps from the Google Play Store (in beta), making the Chromebook that much more versatile. That means you can use Android apps like Instagram and Snapchat on your Chromebook that would otherwise have been accessible only from your smartphone. The system also comes with 100GB of Google Drive Space for two years, which is a welcome freebie. A one-year warranty is included as well. The Asus Chromebook Flip C101PA is an attractive 2-in-1 that is well-suited for those looking for a compact and versatile Chromebook with all-day battery life, a well-rounded feature set and capable performance. Not only is its metal design design attractive, but so is its $299 price tag. Unfortunately, we just can’t picture adults with regular-size hands wanting to use this device regularly. Instead, we see the Chromebook Flip C101PA as ideally suited for grade-school kids. If you can spend more, consider the Asus Chromebook Flip C302CA, which offers a similar design and feature set, but with a larger 12.5-inch display and better performance for $459.